Treatment of the common cold requires time and patient education. This article is part of an ongoing series entitled, Beyond Rx: OTC Corner, which will include topics such as OTC medications, dietary supplements, and other health care approaches that will help nurse practitioners and physician assistants provide patients with tools to manage their health. Robert D. Sheeler, MD, is guest editor of the series. He is an associate professor of family medicine, Mayo Clinic, in Rochester, Minn. He is board certified in family medicine, integrative medicine, and holistic medicine. Treatment for patients with a common cold does not require a prescription. Clinicians should provide evidence-based advice to their patients for the many other options that are available. The first stop at the pharmacy for a patient with a cold is an overwhelming selection of combination medicines for cold and cough. However, cardiovascular and other risks of taking the medication must be weighed against the modest benefit. 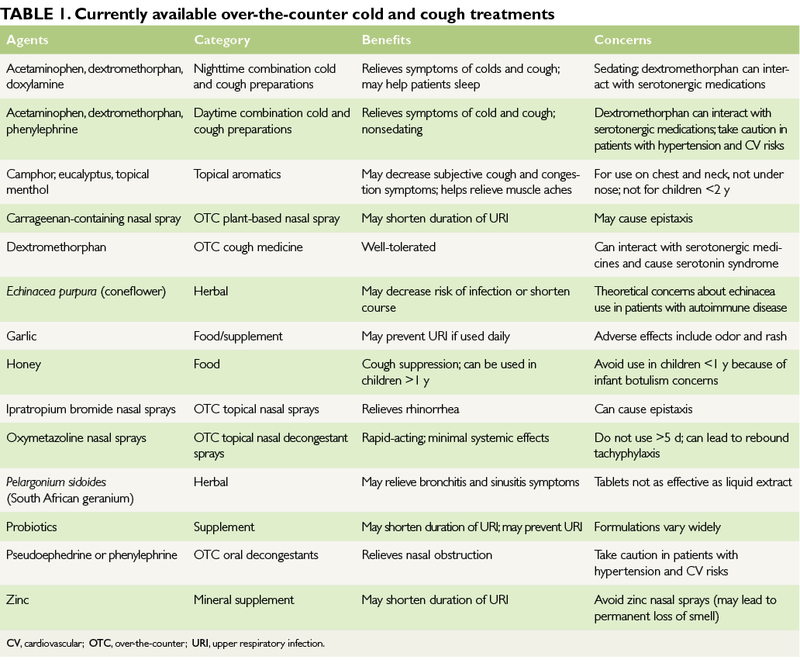 These medications have no benefit in young children, however, and the US Food and Drug Administration warns against decongestant use in the pediatric population. Patients may use nasal sprays either as adjuncts or as alternatives to systemic treatments. Intranasal ipratropium bromide helps rhinorrhea, but it can cause epistaxis. Topical nasal decongestants (such as oxymetazoline) provide rapid symptom relief, but continued use past 5 days leads to rhinitis medicamentosa, or rebound nasal congestion, on withdrawal of the medication. Saline nasal irrigation can be helpful, particularly in children. Guidelines, such as those from the Institute for Clinical Sciences Improvement, recommend gargling with warm salt water (¼ tsp of salt per 8-oz glass of water) to treat a sore throat. Topical products containing aromatics such as camphor, eucalyptus, and menthol also provide symptomatic relief of nasal congestion and cough when applied to the chest or neck. Echinacea, or purple coneflower, used to be more popular among children and adults, but it has decreased in popularity in recent years. Although there is a lot of heterogeneity in the preparations of echinacea studied in the literature, in general, a preparation of aerial parts of Echinacea purpurea is most likely to have positive effects. Echinacea is more likely to prevent colds than shorten their duration.